Ishi may be small but her energy & positivity certainly makes up for it! You come out feeling uplifted! Playful! Paul Banks- Leicester Comedy Scene. Formally, Ishi has been performing comedy since 2008, when she set up a regular comedy cabaret night. She was the resident compere of 2Funny Comedy Cabaret Nights, empowering emerging acts by placing them on the bill with more established Comedians like Sarah Millican, Gary Delaney and Patrick Monahan. In reality, Ishi has been making people laugh since she was born. She came out crying & they all laughed! Ishis first comedy performance was at 5 years of age at Primary School in Zambia. She took to the stage before a Zambian school assembly of nearly 1800 pupils and teachers. Here she sang one of her grandmas favourite Amitabh Bachan Hindi songs, which was so lost in translation in Zambia that it caused a roar of laughter! Instead of running off in tears, she carried on till the end of the song, happy to be causing hilarity. She has enjoyed a captive audience of over 800 on the Red Sea. All aboard Thomson Spirit. 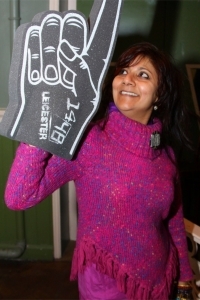 Ishi has been honoured to be a support act for Signatures (Britains Got Talent), Sarah Millican; Mock the Weeks Dara OBrian; John Hegley; Peep shows Isy Suttie; Paul Foot, Patrick Monahan, Suzy Bennett, Shazia Mirza, Brian Damage & Krystal & Gary Delaney. Funny! Enthusiastic! Energetic and engaging! Infectiously entertained the audience from beginning to the end! Impressed with her energy. I will not hesitate to use her services again. Ghartey Vardon Leicestershire County Council. Black Workers Group Conference, Athena, Leicester. Ishi says, freedom is one of the things I love about the UK. Open your hearts, lift up your souls and laugh freely! As well as comedy, Ishi loves traveling, climbing trees and singing to the moon. She speaks English, Punjabi and fluent Cat. Selected as 1 of 100 artists to showcase at Zealous X showcase in Southbanks Oxo Tower, London.